Ever since IT organizations started building networks, and their users needed to have IT resources to get their jobs done, there has been a need for IT management tools. In particular, device (i.e. system) management has been a critical component of the IT admin’s toolbox. 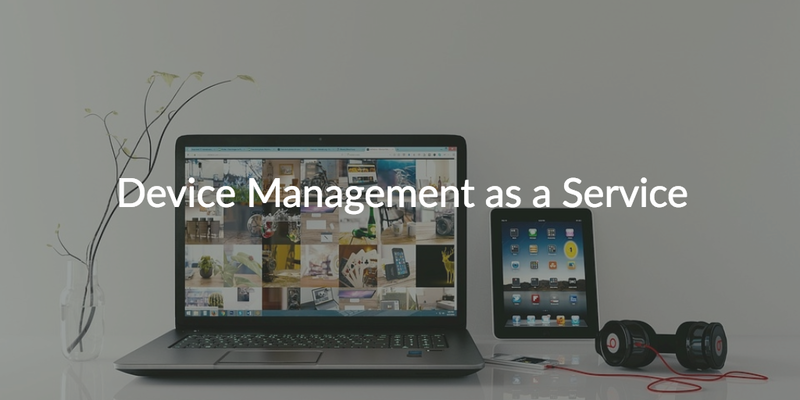 Now, a new generation of device management is emerging in the market, that offers device management as a service. Historically, IT has been delivered in a homogeneous way. Users had the choice of using a Microsoft Windows system or a Microsoft Windows system. There were no other supported options. In addition, virtually all IT resources were on-prem, and the IT organization needed to vet any IT solutions before they were purchased. IT has always strived for efficiency. They want to standardize platforms, providers, and systems to make it easier for them to control the IT infrastructure. One-off choices drove a significant amount of extra work for IT staff, and on top of that most IT organizations didn’t have the management tools to support a wide range of platforms. This is why conventional device management was largely homogenous: one device management strategy for one type of device. Microsoft has historically been the IT management tool provider with solutions like Active Directory® for user management, and SCCM for systems management. This, of course, made a great deal of sense due to the fact that the platforms being managed were predominantly Windows. In fact, the IT management tools helped reinforce Microsoft’s monopoly in the operating system space, which then supported the case to have AD and SCCM. Nobody would have predicted that this upward spiral of profit could be broken, but in the mid to late 2000s a shift in the IT landscape occurred. The introduction of web applications started to change the perception of how applications needed to be delivered to end users. This in turn helped to create a more standard interface for end users, the browser. Of course, a high quality browser could exist on platforms other than Windows, and they did. Mac and Linux machines came on strong with these same web applications, and soon started to take over and become more popular. The end user platform wasn’t the only thing that was shifting. The move to cloud infrastructure through AWS changed the dynamic of the server platform. Windows was being replaced by Linux as the server platform of choice. This move continued to drive the wedge between Windows and mainstream IT. As these changes started to occur, IT admins and DevOps engineers started to feel pressure about how they would manage these systems and devices. Microsoft solutions such as Active Directory and SCCM are tuned to the Windows platform, and often struggle with macOS and Linux machines. This created a need in the IT industry for a new directory that could handle the changes in IT. Fortunately, a new generation of device management as a service platforms has started to appear to help solve this problem. With only one in five devices now Windows, mixed platform environments are a critical part of modern organizations. As a result, IT admins need modern system management platforms to support them. Directory-as-a-Service® is one such platform that is centralizing user and device management in the cloud and as a service. Mac, Linux, and Windows platforms are all treated as first class citizens with full user management control and system management capabilities. On the system management side, IT admins can run standard policies or create their own via any language that the device supports. Audit logging ensures that IT admins know whether a command, script, or policy was successfully executed. This innovative cloud-based directory enables one identity to grant access to nearly every IT resource a user could need, through varying platforms, protocols, providers, and locations. If you would like to learn more about how you could employ device management as a service, reach out to us at JumpCloud. We would be more than happy to talk about whether or not a virtual directory service with systems management capabilities would work for your organization. Alternatively, you can check out our DaaS platform for yourself by signing up for a free account. Your first 10 users are free forever, with no credit card required, and no catch. See for yourself why the future of device management is in the cloud.